Jean-Charles Boisset (left) breaks down his new brewery in Windsor. The invitation to a media preview of Windsor’s newest brewery did mention something about sledgehammers, come to think of it, and joining them to “help break the walls of the past to prepare for our new brewery,” but my eyes skipped straight to “food and beer pairings,” and I wasn’t expecting much more than refreshments followed by a ceremonial swing of a hammer when I walked in the door of Windsor Brewing Company on Wednesday, November 28 to find a wild-eyed Jean-Charles Boisset gleefully wielding a hickory-handled sledgehammer backed by a hooting crowd. The demolition was already in full tilt. 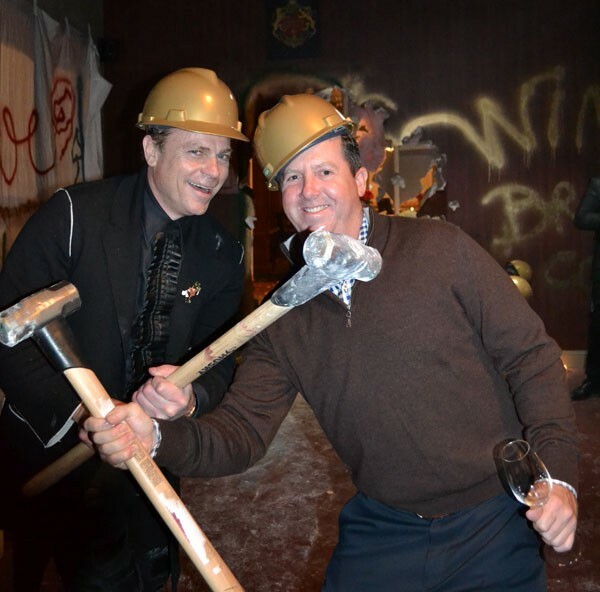 “You’ve helped us save on our contractor’s bill,” Boisset later joked as he explained the brewery’s future. Boisset heads up the Boisset Collection of wineries and tasting salons, including Buena Vista Winery and DeLoach Vineyards in Sonoma County, and he tied in the move to craft brew with the traditions of the Medieval monks of his native Burgundy, who also brewed beer when they weren’t tending to their walled vineyards. 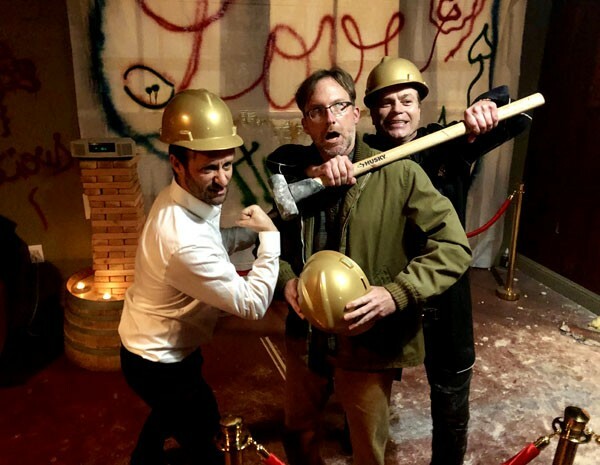 Serving as master of the raucous ceremony, Boisset offered a hard hat and hammer to each new arrival and volunteer from the crowd, urging them to strike the wall that until that night separated the former Old Redwood Brewing Co. from a space that’s housed several wine tasting rooms, none of them for very long, and then posing for pictures with every one of them. With whimsical graffiti sprayed on the walls, insulation hanging in tatters from a hole in the wrecked wall, and drywall dust sparkling in the lights, the scene was more reminiscent of some punk rock move-out party of decades past than an international wine mogul’s wine country event—not likely in upscale Yountville, anyway, where Boisset originally filed plans for a brewery. “Why should we be in Napa when we can be in Sonoma?” Boisset said cheerfully, explaining that a conversation on a dance floor in Oklahoma City between him and Dominic Foppoli, who owns Christopher Creek Winery and is the new mayor of Windsor, and Clay Fritz of Fritz Winery, led to the trio’s partnership in Windsor Brewing. Foppoli was a co-founder of Old Redwood, a one-and-a-half barrel business that opened in 2012. With Boisset’s energy and style, the brewery, slated for actual renovations later in 2019, promises to be an compelling downtown anchor to this town’s beer scene, which now includes Russian River Brewing Company’s big new HQ off Shiloh Road, and craft outfits St. Florian’s and Barrel Brothers tucked away in nearby business parks. Stay tuned. A Bohemian reporter (center) gets more than he bargains for at Windsor Brewing Company's media preview.